Edgewood Manor of Greenfield employees challenged their executive director, Susan Michaelson, to donate Drinks for Dovetail. For every employee contribution, Edgewood Manor of Greenfield would match one-to-one cases of water donated to the children of KAMP Dovetail. 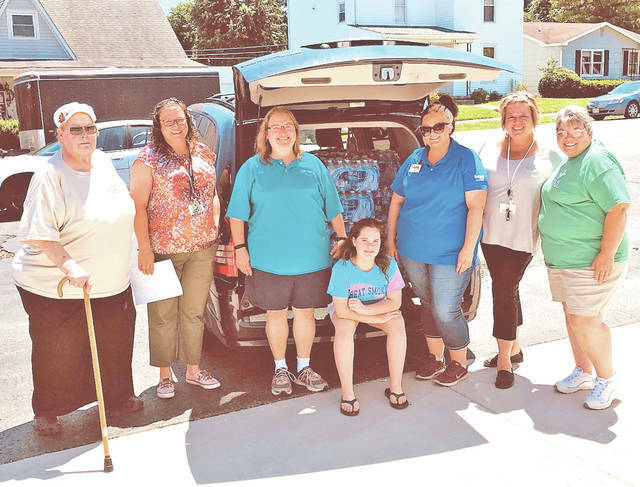 As it happened, the generosity moved Michelle Shumate of Save-A-Lot grocery store in Greenfield to donate an additional 20 cases of water for a grand total of 75 cases. Pictured, from left, are Janice Shuff, KAMP Dovetail volunteer; Heidi Morris, EMG business office manager; Joy Polstra, KAMP Dovetail staff/group leader; Lydia Polstra, KAMP Dovetail volunteer; Michelle Shumate of the Greenfield Save-A-Lot; Elaine B. Williams, EMG social services director; and Rhonda Campbell, KAMP Dovetail donations coordinator. https://www.timesgazette.com/wp-content/uploads/sites/33/2018/06/web1_Dovetail-pic.jpgEdgewood Manor of Greenfield employees challenged their executive director, Susan Michaelson, to donate Drinks for Dovetail. For every employee contribution, Edgewood Manor of Greenfield would match one-to-one cases of water donated to the children of KAMP Dovetail. As it happened, the generosity moved Michelle Shumate of Save-A-Lot grocery store in Greenfield to donate an additional 20 cases of water for a grand total of 75 cases. Pictured, from left, are Janice Shuff, KAMP Dovetail volunteer; Heidi Morris, EMG business office manager; Joy Polstra, KAMP Dovetail staff/group leader; Lydia Polstra, KAMP Dovetail volunteer; Michelle Shumate of the Greenfield Save-A-Lot; Elaine B. Williams, EMG social services director; and Rhonda Campbell, KAMP Dovetail donations coordinator.